As NASA's space shuttle Atlantis touched down for the final time early today, the 30-year space shuttle program came to a bittersweet end. 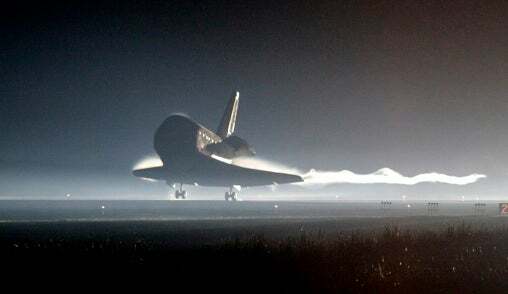 The Atlantis crew landed the shuttle at 5:57 a.m. Eastern time at the Kennedy Space Center in Florida, after 200 orbits around the Earth and a final journey of 5,284,862 miles. The shuttle's last mission was focused on bringing spare parts, experiments and equipment to the International Space Station. This was not only the last space flight for Atlantis. It also was the final space flight for NASA's entire shuttle fleet. All of the remaining shuttles -- Atlantis, Discovery and Endeavour -- are now officially retired. The shuttle Enterprise, which was first built as a test vehicle but never flown, also is considered officially retired. The shuttles Columbia and Challenger were destroyed in tragic accidents that took the lives of two crews. "Although we got to take the ride, we sure hope that everybody who has ever worked on, or touched, or looked at, or envied or admired a space shuttle was able to take just a little part of the journey with us," said Atlantis Commander Chris Ferguson after this morning's landing. Altogether, the space shuttles logged about 520 million miles in space, according to NASA. The combined mileage is more than enough to reach Jupiter. Now NASA will begin to focus on exploring space without the shuttle program. Last year, the Obama administration told NASA to stop internal efforts to build next-generation spacecraft and instead hire commercial companies to build space taxis. NASA engineers have been told to concentrate on developing next-generation engines for the commercially built spacecraft, along with in-space fuel depots and advanced robotics. The administration wants NASA to focus on extending its reach to asteroids, Mars and even farther into space. In May, NASA announced that it is working toward sending a robotic spacecraft to an asteroid by 2016 in an effort to collect more data about the origins of the universe. The $800 million initiative is designed to send a spacecraft to an asteroid, where it will collect samples of the rocky object and return the material to Earth.